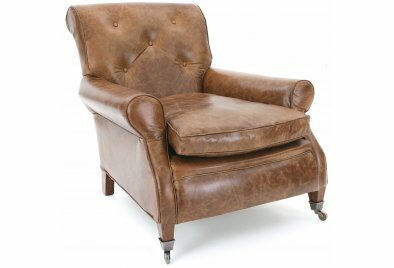 Now here's Florence, a faithful Leather Club Chair. She has a high, deep-buttoned back which leans back at a snooze inspiring angle with a flamboyant roll at the top. Distinctive twin stitching runs all the way around her seams and, as a vintage Leather Club Chair should, she has hand polished, tapered front legs with antiqued bass castors and matching gently curved back legs. Her seat is so deep that even the tallest person can settle back and if you're shorter, well you can curl up on her like a huge cat. If deep seats are your thing, you should try out Hector for size, he's been rumoured to have the deepest seat in the whole of England!